Every reader a book that really speaks to them, mine is Lost Souls by Poppy Z Brite. I read Lost Souls right in the middle of my goth/horror phase – it was the book for horror fans at the time. I’d read and enjoyed a couple of Ann Rice’s Vampire Chronicles but the darker, grittier feel of Lost Souls really resonated with me. I immediately moved on to Poppy’s other books and I loved them all but Lost Souls has always been “the one”. It’s one of the few books I reread and I still enjoy it now, probably because I’m still a sad old goth at heart (I used to have a t-shirt to prove it) and I’m secretly waiting for my real vampire parents to come and get me and whisk me off to New Orleans for a life of absinthe fueled debauchery. 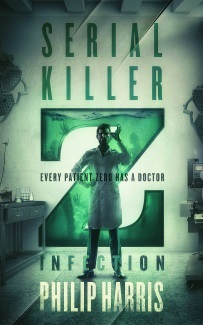 Poppy Z Brite and Caitlin R Kiernan are the only two authors that I really “collect”. I have all their mainstream books (sometimes multiple copies) plus limited editions, signed editions, chapbooks, CDs, monster doodles – pretty much anything I can find. 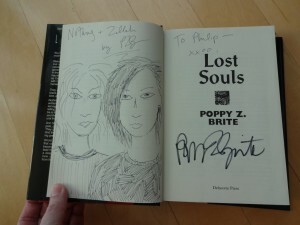 In the case of Lost Souls, I have my paperback reading copy, a mint condition first edition, the 10th anniversary limited edition from Gauntlet Press and now this personalised first edition, complete with a drawing of two of the main characters from the book, Nothing and Zillah. A big thank you to Billy for taking the time to do the drawing. Now all I need is some space on a shelf to store it.